My goal with the sleeves was to make them as puffy as possible. I started with the actual sleeve pattern from the tunic, and made it almost twice as wide and a bit taller (basically figure 2 below). This is the part where I realized I didn’t quite have enough fabric (who knew 3 yards wouldn’t be enough…). So I had to cut the sleeves in two pieces, with a seam running down the outer arm. Fortunately it’s hardly noticeable with all the puff. To make the sleeve puff, I gathered the top edge of the sleeve, and sewed it into the dress. Then I made a wide hem at the bottom, leaving an inch or two open at the underarm seam. I threaded elastic through the hem and tied it off at approximately the length to fit comfortably around my arm. I’m really happy with how the puffed sleeves turned out – I think they’re my favorite part of the whole dress. This entry was posted in Costumes, Projects. Bookmark the permalink. I love these sleeve patterns! 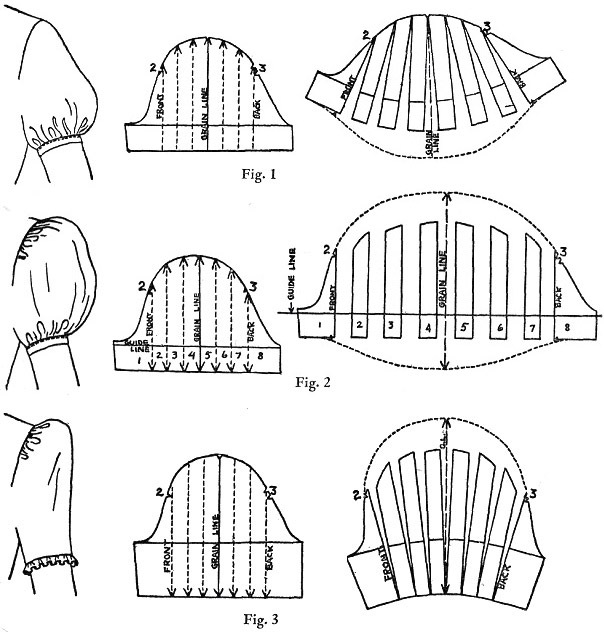 Thank you for these sleeve patterns, they are really helpful! why I am unable to join it. Is there anybody else having identical RSS problems? Sharon Jackson . UK .